This is amazing. 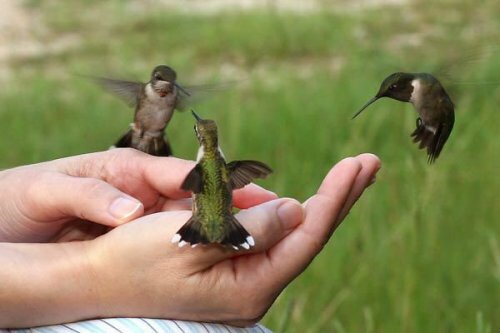 Apparently, hummingbirds will feed together when they are migrating (usually they are very territorial and will engage in aerial combat before they'll share a feeder). Abigail Alfano of Pine, Louisiana trained these beauties in September 2006. More here. 1.The hummingbirds must become used to your yard and the best way to achieve this is to offer them multiple sugar-water feeders. 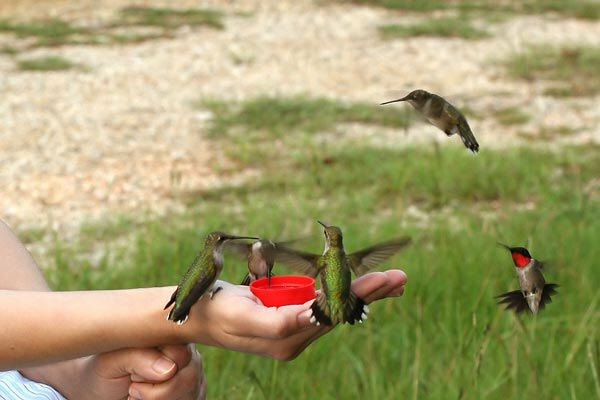 2.As the number of hummingbirds visiting your feeders increases, you must start spending time outside in order to get the birds used to your presence. This will take some time and in the beginning presence may drive the birds away. You must be patient and persistent. Eventually, the birds will come back. 3.Once the birds are used to your presence there, you can hold a sugar-water feeder in your hand. Over time, the birds should eventually begin feeding from the feeder you are holding. 4.On a day where you have a great deal of hummingbirds visiting your feeders, you will want to remove all but one of your hummingbird feeders. Next, you will want to place a small container filled with sugar-water in the palm of your hand. For example, when Abigail did this she used an old milk jug lid. 5.Now comes the hard part, you must sit outside and wait. This takes time and patience. You will want to choose a day when you have a large number of hummingbirds visiting your yard and you will want to remove all other food sources, because this will improve your chances of success.